♦ Stylish curved architectural video intercom with keypad. ♦ Modern blue back lighting effect. ♦ Marine grade, brushed stainless steel construction with gloss acrylic trim. ♦ Speak to and see your visitor from your smart phone. ♦ Easy wireless connection to existing home Wi-Fi. ♦ Up to 60 metre range with included directional antenna (dependant on location of router in house). ♦ Range can be extended to several hundred metres with additional devices such as wifi repeaters. ♦ Can call up to 4 devices at the same time. ♦ Get a video call from your gate/door even when away from home. ♦ No data use when phone on Wi-Fi connection. ♦ Simple set up by mobile phone. Connect to the intercom directly through your phones Wi-Fi, enter the pass code for the home hub Wi-Fi and the device is connected. 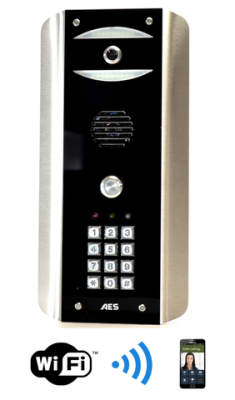 ♦ View the gate/door and open any time with monitoring mode. ♦ Stores images of the last 32 missed callers on your phone. ♦ Still works locally on Wi-Fi network even if broadband goes down. ♦ Can work with most market standard outdoor Wi-Fi repeaters for extended range. Full duplex speech, 2 relay outputs, latching outputs for hold open, CAT5 terminal port for easy hard wire option, enhanced true colour camera.